I appreciate the counter argument! Regarding automated farms, I don't want the value of items to be deflated. If someone can farm 2000 carrots a day, they'd probably part easier with a stack of carrots than say someone who farms considerably less. Since you're tying in the Plugin thread, my idea was that if we end up using the Jobs plugin then farming carrots (or melons, sugar cane, cows, etc) can be incredibly lucrative. As the player will get denarii from the harvest and from the sale. I think it's vital we have a form of currency because we will have Towny and more than likely SignShop. Though, I won't stop players from trading. As for your second example with diamonds. I see that differently. Just like I wouldn't compare the lap times of my JCW Mini Cooper against that of a Formula 1 car. We could metaphorically say the automated farm is a tool but I see it as a factory. For instance, let's compare an Etsy shop to that of a Brick and Mortar Store, or BMS. You see a bracelet with one rock tied to a leather string you want to buy someone on Etsy and it's $30 + shipping. You're appalled. You decide to check BMS online, it's 14.99, plus the website says it's in store. Great, you buy it at BMS for about $17 after you factor in tax and gas. If the Etsy shop wanted to lower their price they'd either have to devalue their work on the item or produce more. So, this shop owner has had enough of BMS taking their business and decides to get a factory going. Shop owner realizes a factory would be too expensive after they get the estimate for the construction, the permits and, machinery. Now, coming back down to Minecraft, if someone wants to create a 40x40 melon farm then great. I'm not going to restrict the size of a farm, just that it's automated with (as you mention) redstone. I had no idea Villagers could help farm and if players want to utilize villagers then so be it. Regarding trapping and guiding mobs with with water I would have to argue that using a spawner, or spawn condition mechanics repeatedly, would be considered automation. But towns should have mob spawns turned off so this isn't really a thing I've concerned myself with. On the other hand, I also haven't thought of this predicament yet. For activity, I'm all for a weekly hunt. I tried that within Spawn in 1.8 but it turns out chests weren't openable because of SignShop - the chests I "hid" are even still around spawn, though empty - so it's something we'd (Kerm & I) would have to model the spawn region permissions for. I'm also hoping that with the inclusion of PvP arenas, players will create their own events too. If PvP get's popular enough it can become a staff sponsored event where we can have 1v1, 2v2, 4v4. Have a championship ladder and ultimately prizes. Of course, I can see myself using a PvP arena for a fun and harmless snowball fight every now and again. Does it fit well with the environment? The "cost" of something shouldn't be decided on the spot, it should be decided some time after the construction has been finished/finalized and it's impact can be judged. I might have missed some stuff? if someone wants to create a 40x40 melon farm then great. I'm not going to restrict the size of a farm, just that it's automated with (as you mention) redstone. I had no idea Villagers could help farm and if players want to utilize villagers then so be it. I think the definition of automation is far too vague to try and enforce it, plus the idea that it's really one of the only forms of being clever to do something in PvE. Essentially in the end, we're at least banning the usage of redstone for most applications you would even care to use it for. But even as far as taking advantage of the fact that mobs spawn repeatedly knowing what their spawning conditions are-- that is as simple as running through the wilderness at night in an open field where mobs will consistently spawn, and all you have to do is shoot them all down with a bow and you won't even have to directly engage them, and they will keep spawning. Like, there's no fancy collection system or anything, and that could be considered automating or speeding up the process. We're drawing a bunch of lines on automating things where the definition isn't as simple to define, and drawing it in an area which I think takes the fun away from some things. I was actually looking very forward to designing some clever redstone-powered farms or making a new design for my Mega Mob Masher that I've pretty much had plans running for since 2013 when we were on Minecraft 1.5, so needless to say, I will be very disappointed if an arbitrary restriction is placed on redstone and general 'automation'. That's a good point for the reimbursement. I think reimbursement shouldn't be a promise. It should be a factor of multiple things. As you listed, I think these are reasonable questions to ask, and ways to judge someone's build on, and whether or not they are reimbursed. Definitely, I think it should be very clear from the start that reimbursement is no promise, but rather if you wish to be reimbursed for your work, you can increase your chances greatly by showing how much effort you put into it based on how it looks, not by how long it is necessarily. Plus, it would be one of those things which are also not just judged on the spot, but let's say if we wait a while before giving a final call on something, it allows some time for other people to see the path, leave their compliments, thoughts, etc. I will also advocate against banning redstone devices for automated farming. I've spent the last few months learning how to do things with redstone, so I can get food and other items while I build other things. If I spent the entire time farming, I'd never get any building done. As for mob farming, my plan was to use an automated egging system so I could stock up on zombie eggs and the like, so we could stock up on them without needing admin assistance. Taking away automation, you might as well just set the server to creative so we can build pretty houses and such, and not worry about anything else. I've spent the last few months learning how to do things with redstone, so I can get food and other items while I build other things. I have put a lot more thought into what I would like to do in 1.9 not only aesthetically (which I have been focusing a lot on), but also functionally. I have been eager to implement my ideas in 1.9, and be satisfied with my more functionally-developed town, or otherwise establishment. In the least, I was hoping to make at least some simple, automated food farm that at least gives me (or any people I am collaborating with) the resources without much worry. I would still be interested in selling my goods I produce too. In that idea, we have been discussing the impact on the economy this would make by [continuing] to allow the automation in farming anything, but honestly, this was never an issue to begin with. This isn't like the gold inflation where someone is producing 90% of the server's income with a lag-o-riffic beast of a gold farm, and because of that, they can just buy out all of my stock everyday if they wished to without lifting a finger. This is more like, the worst thing that happens is, someone makes the largest sugarcane farm on the server, and essentially they drop the price of it down to the lowest price really anyone would offer. Even on the current server iteration, this isn't happening to a point where anyone has pointed it out. I don't feel like anyone actually has a problem with redstone automation of food or mobs, so as long as it doesn't lag the server, which is actually relatively hard to do if you're not spawning 500 pigmen in from hundreds of oversized portals every couple minutes. For much of anything I could discuss, I could only see a couple people realizing their business competition, and at most, increasing their efficiency. But especially on a PvE, more community-oriented map that is done with PvP (as far as the eye can see), there is no real reason why I would see anyone having any problems. A point I would like to contribute for the argument against stopping automation, is that the server has an AFK timer that is meant to enforce AFKing-- we want our members to be actually playing the game, rather than sitting at something like a gold farm for 12 hours a day AFK. You have to actually be around your town or farm, and also not AFK to make it produce anything. You can't just sit at your sugarcane farm for 12 hours, and make massive amounts of material goods that way-- you must be active around the farm. I think there would still be the satisfaction of actually building aesthetical things in survival Minecraft, however, by taking away the redstone that is really used mainly for farming things, you take away the functional aspect of survival, as I mentioned, building things that are not only aesthetical things, but things that actually function and have more purpose. A very good portion of the Minecraft community, like the general, broader, millions-of-people community, has interest in automating things and building things related to this. I went back and looked through, and saw that you wanted to do an allowance thing. Vanillaverse kind of has something like that. They give you 65 chunks (their currency name) per every logged in hour you are there. You get additional currency for voting vanillaverse in their different server lists they have. 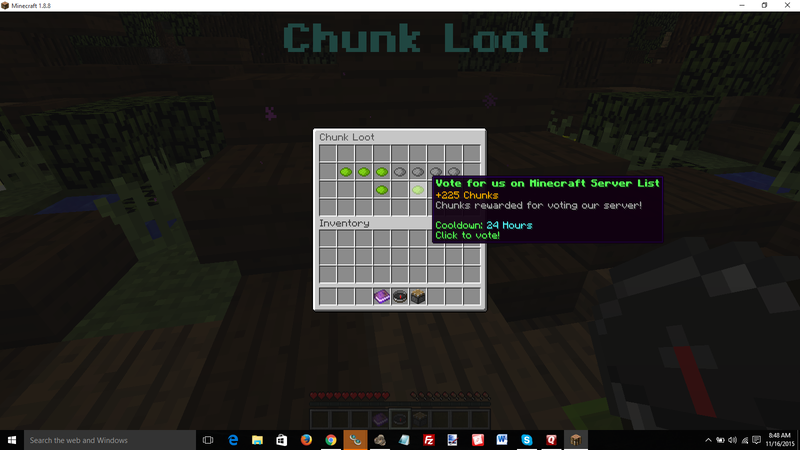 The first top slot gives you 250 chunks per 24 hours. Once a month, for every rank you have donated money to obtain, you get 1000 chunks. In my case, I can get 2000 chunks each month. The two lower ones are the ones you can click to vote for vanillaverse. Each one is worth 225 chunks. The links are such: http://www.planetminecraft.com/server/vanillaverse-2881610/vote/ and http://minecraft-server-list.com/server/219483/vote/ in the order shown in the screenshot. I place that up for consideration. I will agree that getting rid of overworld pigmen spawners (via portals) is a good idea. Vanillaverse ended up doing it for a time, because it was causing some heavy lag on their server. We can easily get gold from mining and killing pigmen in the nether, no big deal, so let's leave it as the currency. Maybe when generating the world, we can make the chances of gold spawning to be slightly heavier? That might help offset things, as well. Automated farms aren't a problem for food, if a person can't farm and sell things, there are other things they can do to make money. Just look at my shop, I sell a lot of different things. It's up to the players to figure out what to sell. My plans for my town in 1.9 is a place where people can store common goods, like cobble, stone, etc in a single building. That building will also contain chests from automated farms that aren't linked to the item sorter, that will house things like sugarcane, watermelon, pumpkins, and the like. People will freely have access to this food, so currency goes out the window for this. Heck, I was thinking for the spawn area, to set up a chicken farm so people can snag some free chicken right from the get go. It ultimately sounds like to me that by banning automated farming (which really is regulated by forcing a user to be active on the server-- they need to be doing something else meanwhile, and not online for the sole purpose of AFKing), we are essentially banning the usage of redstone contraptions in farms, which I think is crazy. Holy what the hell? Somehow I missed that comic was advocating banning automated farms for things other than gold; I thought he was just talking about gold. Just banning gold farms is pointless, and banning all automated farms would be staggeringly short-sighted. Many players, myself included, find most of the fun in Minecraft in creating clever, compact, high-efficiency machines to farm various items, including bones, arrows, gunpowder, rotten flesh, string, spider eyes, redstone, glowstone, sticks, and potion bottles from darkroom spawners, myriad animal items from spawner farms, carrots, wheat, sugar cane, potatoes, cactus, mushrooms, and more from automated or villager-automated farms, and much more. We might as well not call ourselves Intelligent Survival if we try to ban automated farms, and I know that I for one wouldn't bother playing on the server if that was the case. Not in a ragequity, stop-making-it-unfun way, I just wouldn't have enough good reason to play on the server. I strongly urge you to rethink your position on automated farms, comic (which I guess would also mean going with something like lapis ore, as I've been urging for several pages, for the economic item). I think rewarding people for voting once a day as the kit trigger is a great idea. I still want to push my idea of a daily allotment for currency. Such as 1000d per 24 hours. Log in once a day to collect, if you miss a 24 hour period you miss out on that payment. I think it's easier to implement than my whole "The amount of time you're on the server each day up to a certain time determines the amount of money you get." Of course, you can earn more by mining for goods and selling them. I'm not in general the biggest fan of this kind of thing, especially if it involves additional beyond-vanilla things, but I can see how from a neutral perspective, this would possibly be effective in helping server activity. I'm much more for an economy where we trade items for items, instead of worrying so much about what official currency we use, so we just let the market flow naturally how it would flow, and we don't have to worry so much about inflation and all that other stuff. In the context of like some sort of daily/weekly/monthly/some basis for earning something for simply coming online, perhaps a player earns a diamond for coming on, or something like this? Or perhaps the whole voting once a day deal for something is also good? Many players, myself included, find most of the fun in Minecraft in creating clever, compact, high-efficiency machines to farm various items, including bones, arrows, gunpowder, rotten flesh, string, spider eyes, redstone, glowstone, sticks, and potion bottles from darkroom spawners, myriad animal items from spawner farms, carrots, wheat, sugar cane, potatoes, cactus, mushrooms, and more from automated or villager-automated farms, and much more. We might as well not call ourselves Intelligent Survival if we try to ban automated farms, and I know that I for one wouldn't bother playing on the server if that was the case. Not in a ragequity, stop-making-it-unfun way, I just wouldn't have enough good reason to play on the server. I strongly urge you to rethink your position on automated farms, comic (which I guess would also mean going with something like lapis ore, as I've been urging for several pages, for the economic item). I sure do have a lot of things to say, and I do have to say, this was very well put, and I have very little to add to this other than my upvote. I really do have to say, that this is Cemetech we're talking about here-- a site which revolves around technology, programming and particularly calculators. Our values that we promote are as Kerm has described, hence our "Intelligent Survival" title on the server. In 1.9, I hope that this vision is further carried out not only through the graylisted, more mature, constructive group of individuals, but namely on this topic, the great contraptions that we will come up with that will be integrated within our builds (which in and of themselves will be amazing aesthetically on top of that functional component). .... You get additional currency for voting vanillaverse in their different server lists they have. I am terribly against that kind of involvement. Asking for votes in exchange for money is the equivalent of spam in my opinion. Similar to how apps ask for five star ratings in exchange for an item or currency. I uninstall an app when I see that. But for what it's worth, I've stopped installing games on my phone for other reasons (but I do keep a few of my favorites). However, I do see the temptation in increasing our visibility on rankings and polls. Secondly, asking for real world money in exchange for server benefits is another big no-no in my book. And I will always vehemently forbid such a thing unless absolutely necessary - i.e. if there's 20 active players at any time and we need a new dedicated server for MC. That's a very valid point and I recognize it. But let's focus on the big picture here. I'm advocating for the removal of automated farms if we go with the jobs plugin. And only in that instance. This quote in particular is taken out of context in my opinion and may have attributed to your guys' assumption I want to ban automated farms no matter what. In case it isn't clear, I'm leaning more towards a RPG play style without the quests and lore. I'd like to encourage folks to join who don't like mining in caves for whatever reason. By making the game equally level so those players can farm or create weapons for currency could open a huge door, conversely that would severely limit the enjoyment of an already established player base. I was aware that 1.8 was an Intellectual Survival but must have missed the decision that said 1.9 was going to be as well. I assumed it wasn't necessary to make that decision, considering Cemetech's audience and membership. If it's an "If A, then B; If not A, then not B" about jobs and automated farms, I am rather against any server-provided jobs, payment, and all that, and very much for players being able to make any automated farms that they want. I think the only possible source for server-provided currency should be voting, if even that. If it helps, I was against the idea of jobs even without the interrelation of automated farms. To me, any redstone automation device is an inherent part of Minecraft, and greatly contributes to the gameplay of the game. It gives the player the feeling like the world around him is evolving. In the first part of the game, you invest time and resources to get better tools, after that you will start investing time and resources into enchanted tools and so on. Similarly players spend a lot of time and resources to build an automated system for various things. This also correlates to a high degree with human evolution throughout the ages in real life. I also think that having automated farms for certain things will make it easier to get some materials that can be used to build things. In short: Redstone machines are way cool, and having them will result in more, prettier and better builds. Regarding jobs, people do jobs (build buildings/redstone devices, clear forests, dig tunnels, etc) for diamonds, since the currency on VV cannot be given to other players. So in reality, we'd not really need a jobs plugin, but those that are wealthier on the server could hire other players to tend to farms and do other odd jobs. Heck, I cleared a 50x50x50 area for one player on VV when I first started, just so I could get a double chest of andesite, so.. So in reality, we'd not really need a jobs plugin, but those that are wealthier on the server could hire other players to tend to farms and do other odd jobs. Exactly; I see no reason to make it any harder than this. I did similar jobs back on Evocat.us, where players needed annoying digging work done, and I needed materials. In some cases I even negotiated the employer providing the tools. Perhaps we could have some place people could post Help Wanted signs, and/or offers to do work? Exactly; I see no reason to make it any harder than this. I did similar jobs back on Evocat.us, where players needed annoying digging work done, and I needed materials. In some cases I even negotiated the employer providing the tools. I agree that using a plugin for this isn't necessary, and that it would be a lot better to have player-player interaction for jobs. I actually have been paying some players on the 1.8 cemetech world already to help clear out mountains for my temple. There seems to already be a general idea about how the economy should be, money is gained by selling non-renewable items such as lapis ore to prevent easy money gain by farming en masse. This kinda defeats the purpose of big automated and redstone-y farms. Instead I propose a sort of "flooded supply" system. Say you could sell crops but the price per unit decreases as you sell more per day. If you sell 1 wheat, you'd get 0.1d per, but if you'd sell 1000 wheat, the price would decrease gradually to 0.01d. After a while the price would be restored. This would obviously be per player so that people with big farms wouldn't be extremely overpowered, while still making farming a nice option for a new player. This would also again have to be combined with some sort of money sink such as town plot costs to keep inflation at bay. [ACagliano] comic, question. since the current currency is not farmable, if time reveals the economy starting to run out of money, would you consider some form of incremented stipend to players? The Abba Caving events will happen in a new world. Since a majority of these will be server sponsored events we'll use a new world each time so as not to take all the loot/ore from the main world. Additionally, the world will only be open to those participating in the Abba Caving match and the world border will be set accordingly. After the match is done the world border will be expanded and all players will be able to freely come and go to farm for ore and materials in the Abba World. However, do not make yourself at home. The Abba world will be frequently deleted and written over with a new world (Maybe once a month?). If you build a house in the Abba world, you will lose it. If you store any items in the Abba world, you will lose them. I will not be giving back items you forgot to take back with you when the Abba world is deleted. If you sign out in the Abba world and sign on again after it's been reset and you die for being outside the border, I will not give you your items back. You are responsible. © Copyright 2000-2019 Cemetech & Christopher Mitchell :: Page Execution Time: 0.110847 seconds.